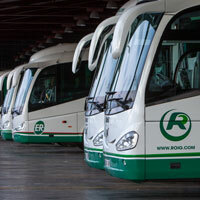 The ROIG Bus line introduced five new vehicles in June. The new units have Irizar, Beulas and Ferqui chassis and Volvo, Scania, Man and Iveco engines. All coaches purchased this year have the most advanced technical and safety features, making the fleet very modern and providing high-quality transport for passengers. PreviousPrevious post:SUPER INSTAGRAM GIVEAWAY!NextNext post:Welcome, 2018 fleet!